Hi loves! Today I am showing you a polish you have seen here before, but I wasn't extremely happy with my swatches and also I wanted to wear this again, to see if my topcoat I now use could get rid of the gritty feeling this polish has. Luckily, it did! Gotta love that Essence "gel" topcoat ♥. Cult Nails Living Water was part of the Inaugural collection in 2011 and has now become limited edition. So if you want this, don't wait too long or it'll be gone forever! 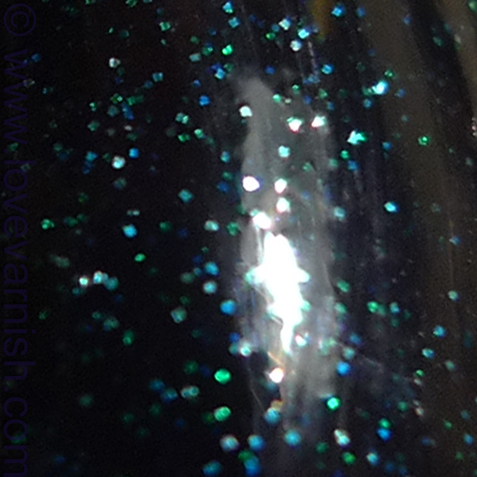 It has a blackened blue/teal jelly base (which becomes nearly black as you paint it on) filled with microglitter in ice blue and emerald green. This really fits the description as found on www.cultnails.com. I used 3 coats this time (my first swatch was 2 coats) because in my swatch light I could see some bare patches after 2 coats. Because of the jelly nature of this polish you really need the coats to dry in between! I first used a simple coat of clear before topping it with my topcoat and that did the trick for the gritty feeling this gets after a few hours of drying! Oooo I love this! Gorgeous!! I got this one about 1.5 yrs ago. Mine is nothing like your photos at all. It's very black. 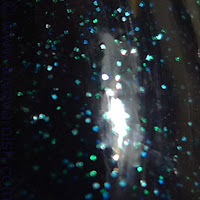 The microglitter is in there because it's very gritty and does not dry to any decent shine at all. It needs gobs of clear topper to smooth it out. I have found as Cult does different production runs on their polish, the shades change somewhat. Mine might be older than yours. It's what I call a very dead polish and I have to say as much as folks talk about great things from this brand, I have more misses than hits from it. Ooo, pretty! 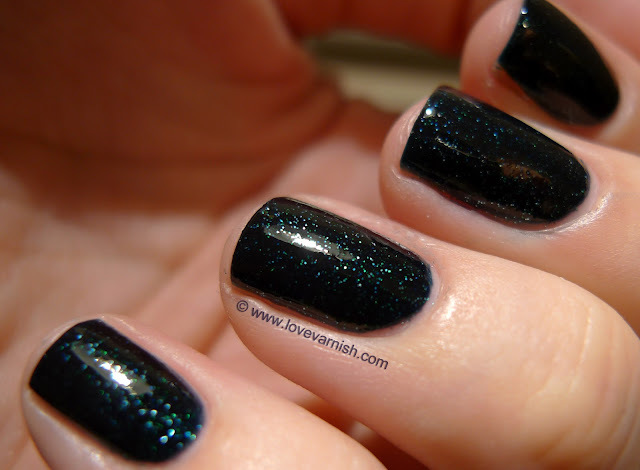 I might have to get this Essence topcoat, I've heard so many good things about it now. Thanks Jamie! It is a lovely polish ♥. Hey! Do you mean you can't see the microglitter, only feel it because of the grittyness? Without TC my bottle is a hot mess too, it's really gritty so it does need some love to bring out this shine. My bottle can easily be the same age as yours, but that still doesn't always mean something. I just find it weird Maria wouldn't do regular quality checks on her polish! Too bad you have a bad experience with this brand :(. You should! Though it isn't as smoothing as Gelous for example, but putting a simple not quick drying clear coat in between really helps with the glitter/topcoat eating. I like the brand a lot too!